최근 geo-replicated data store에서 높은 consistency를 제공하기 위한 연구들이 많이 있다고 한다. – 이 논문에서 나열하고 있는 그런 논문들의 목록도 흥미로운데 이는 마지막에 한번 정리해보자. – Facebook에서도 사용자들에게 – 특히, 읽기에 대한 – end-to-end consistency를 제공하기 위해서 이러한 연구 결과들을 도입하고 싶으나, 여러가지 이유로 이것이 쉽지가 않은데, 그 이유가 무엇인지 일단 알아보자…라는 것이 이 논문의 취지. Facebook은 확장성과 효율을 위해서 샤딩, 복제, 캐싱 등을 아주 많이 활용하고 있는 것으로 보인다. Sodcial graph 시스템을 예로 들고 있는데, 하나의 node나 edge가 MySQL(! )에 쓰여지면, 이것이 비동기적으로 다른 데이터 센터로 복제되고, 여러 계층의 캐시들을 업데이트하고, pub-sub 시스템에 의해 검색이나 뉴스피드를 위한 다른 시스템으로 전달된다. 당연한 이야기지만, Facebook 내의 여러 기능에 해당하는 시스템들은 효율을 위해 각자 특별한 샤딩 방식이나 캐시, 인덱스들을 유지해야한다. Twitter (http://blog.lastmind.net/archives/664)나 LinkedIn (http://blog.lastmind.net/archives/657)의 시스템과 같이 Primary Data Store (DB)로부터 비동기적인 복제를 통해 Secondary Index를 생성하거나 다른 서비스로 이벤트를 전달하는 방식은 현재의 대규모 인터넷 서비스에서는 매우 공통적인 부분으로 보인다. Facebook relies on sharding, data replication, and caching to efficiently operate at scale. When a node or edge is added to the social graph, it is first written to a single MySQL instance. From there it is asynchronously replicated to all of our data centers, updated or invalidated in multiple layers of cache, and delivered through a scalable publisher-subscriber system to other services such as Search and News Feed. No single data placement strategy can efficiently serve all workloads in a heavily sharded system, so many of these services choose a specialized sharding function and maintain their own data store, caches, and indexes. Facebook의 Social graph는 여러 서비스들을 위한 시스템에 각 서비스를 위한 형태로 복제되고 있다고 한다. 문제는, 대부분의 연구 결과들에서 나타나는 설계들은 단일한 서비스를 상정하고 있다는 것이다. Facebook는 그러한 여러한 서비스가 따로 사용자에게 제공되기 보다는 하나의 서비스처럼 제공되므로 여러가지 문제들이 발생하게 된다. most research designs assume. This difference alone is not fundamental—Facebook can be externally viewed as a single service even though internally it is comprised of many services. Facebook의 각 서비스들은 Social graph의 일부에 대한 캐시, 인덱스, 복제본 등을 가지고 있다. Wormhole이라는 Facebook의 pub-sub 시스템은 업데이트를 비동기적으로 여러서비스들에 전달해주고 있다. In a sharded and scaled environment like Facebook’s, services may maintain their own optimized cache, index, or copy of a portion of the social graph. Wormhole  is our scalable pub-sub system that asynchronously delivers update notifications to all of the services that manage state. 이 때, 만약 높은 consistency를 제공하기 위해서는 동기적으로 업데이트 통지를 전달할텐데, availability와 latency를 떨어뜨리는 요인이 된다. 인과성을 위한 시스템을 사용하더라도 여러 서비스들 사이의 의존관계를 표현하는 것은 굉장한 복잡도를 가져오게 된다. To provide strong consistency across our services, we would need to propagate update notifications synchronously impacting availability and latency. A causal system could avoid atomic updates, but would still need to be integrated into every service and threaded through every communication channel greatly increasing the complexity of the dependency graph. 클라이언트는 한 화면에서 표시되는 여러 컨텐츠를 별도의 리퀘스트를 통해 가져와서 클라이언트에서 통합한다. 이 때문에 클라이언트는 일관되지 않은 결과들을 가지고 session-based guarantee를 보장함으로써 사용자에게 일관된 상태를 보여주어야 한다. The Facebook web site and its mobile applications use parallelism and pipelining to reduce latency. The notification bar and the central content are fetched by separate requests, for example, and then merged at the client. Mobile applications also aggressively cache results using local storage, and then merge query results with previously seen values. […] but it leaves the user’s device as the only safe location to define session-based guarantees or demarcate isolation boundaries. 단일한 사용자는 보통 동일한 지역의 동일한 클러스터로 라우팅 되므로 이러한 성질은 사용자가 inconsistency를 경험할 확률을 낮추어준다. 하지만, 그러한 성질이 보장되는 것은 아니므로 역시 문제는 있다. Requests for a single user are usually routed to the same cluster in the same region. This routing stability assists in reducing the number of user-visible inconsistencies, because most of the variance in asynchronous update propagation is inter-region. 조금 설명이 애매하기는 한데, 여러 서비스로부터의 결과를 조합해야할 경우, 그 사이의 의존관계를 다루어야 하는데, 각 서비스는 각자의 서비스를 위한 일부의 결과를 가지고 있기 때문에, 이를 일반적으로 처리하기가 쉽지 않다는 의미인 듯 하다. Each service can be thought of as implementing its own limited query language, so it is not clear that the dependencies can be captured in a way that is both sufficiently generic and sufficiently precise. 사용자 입장에서는 하나의 쿼리지만, 내부적으로는 여러 서비스들에 대한 수천개의 쿼리로 실행될 수 있다는 이야기. For example, a user’s home page queries News Feed to get a list of stories, which depends on a separate service to ensure story order of previously seen content. These stories are then fetched from TAO to get the content, list of comments, likes, etc. In practice, this behavior produces fork/join query patterns that have fan-out degrees in the hundreds and critical paths dozens deep. 동일한 데이터가 각각의 서비스에서는 서로 다른 샤딩 방식과 인덱싱을 통해 저장되므로, 서로 다른 서비스들의 샤드 사이에 all-to-all ordering 의존 관계가 발생하고, 높은 consistency를 요구하는 시스템에서는 하나의 서비스에서 하나의 샤드만 실패 또는 지연되더라도 이에 의존하는 모든 다른 서비스의 모든 샤드에 영향을 줄 수 있다는 이야기. Different services use different sharding and indexing schemes for the same data. For instance, TAO shards data based on a 64-bit integer id, News Feed shards based on a user id, and the secondary index system shards based on values. The use of different sharding schemes creates all-to-all ordering dependencies between shards in different services. This connectedness accelerates slowdown propagation in strongly consistent systems. A failure in one shard of one service would propagate to all shards of a downstream service. 여러 쿼리들을 조합해야하는 경우, 하나의 쿼리만 느리더라도 최종적인 응답에 영향을 미칠 수 있음. 이것이 strong consistency와 직접적인 연관성이 있는지는 명확하게 이해하기 어려우나, strongly consistent system의 응답속도나 outlier들이 그렇지 않은 시스템들에 비해 더 높기 때문에 언급되는 것 같음. Parallel subqueries amplify the impact of latency outliers. A user request does not return until it has joined the results of all of its queries, and thus must wait for the slowest of its internal requests. 데이터의 개수도 많고 매우 자주 읽히는데다 쓰기도 많은 무언가를 Linchpin Object라고 부르고 있다. 흔히 Facebook의 연예인 페이지나 유명 대기업의 페이지를 상상하면 될 것 같다. 역시 좋은 성능을 제공하는 것이 strongly consistent system에서는 중요하다고 얘기하고 있다. The most frequently read objects are often also frequently written to and highly connected. Examples of these linchpin objects include popular users like celebrities, popular pages like major brands, and popular locations like tourist attractions. […] A system that provides stronger consistency must provide good performance for these linchpin objects. stronger consistency는 프로그래머가 프로그램의 정확성에 대해 생각하기 편리하고, 사용자에게 일관성을 제공한다는 측면에서 이점을 가지고 있지만, 이를 정량적으로 측정하기는 어려울 뿐만 아니라, 그러한 이점들이 단점들 – 커뮤니케이션 오버헤드, 무거운 상태관리, 응답속도의 증가 – 을 넘어서지 않을지도 모름. Systems with strong consistency are easier for programmers to reason about and build on top of [6, 12] and they provide a better experience for users because they avoid some anomalous application behavior. However, these benefits are hard to quantify precisely, and they do not appear in isolation. When all aspects of user experience are considered it might even be the case that the benefit does not outweigh the detriment. […] Stronger properties are provided through added communication and heavier-weight state management mechanisms, increasing latency. Although optimizations may minimize these overheads during failure-free execution, failures are frequent at scale. Higher latency may lead to a worse user experience, potentially resulting in a net detriment. 여러 서비스가 얽혀있는 복잡한 시스템에서 실패나 복구 방법에 대해 미리 예측하거나 관찰하기 쉽지 않을 뿐더러 이를 정형화하기도 쉽지 않다는 얘기. (아마도 백엔드) 서비스 내에서 C++이 가장 보편적으로 사용되는 언어인 것은 매우 신기함. 여러 언어를 사용하고 있기 때문에 인터페이스나 쓰레딩 모델 등에 대해 가정하는 것이 어렵다는 이야기. consistency platform. Perhaps the trickiest part of this multi-language support is the wide variety of threading models that are idiomatic for different languages and runtimes, because it is likely the underlying consistency system will need to initiate or delay communication. 낮은 레벨의 서비스들은 매우 보수적인 deployment 프로세스를 가지고 있으므로, 이에 관련한 시스템을 빠르게 개발하는 것은 쉽지 않을거라는 이야기. Facebook has an extremely aggressive deployment process for the stateless application logic, but we are necessarily more conservative with stateful and mature low level services. An inter-service coordination mechanism that is used by or interposes on these low-level services will have a deployment velocity that is constrained by the release engineering requirements of the most conservative component. consistency에 관해 이미 적용된 workaround들이 있으므로, 이를 일반적으로 개선하는 시스템의 이득이 떨어진다는 이야기. While these workarounds would not exist in a newly built system, their presence in Facebook reduces the incremental benefits of deploying a generic system for stronger consistency guarantees. B. Atikoglu, et al. Workload analysis of a large-scale keyvalue store. In SIGMETRICS, 2012. R. Nishtala, et al. Scaling memcache at facebook. In NSDI, 2013. N. Bronson, et al. 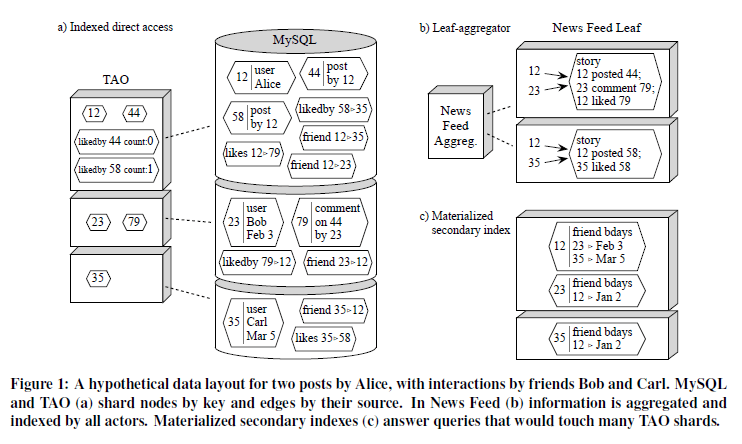 Tao: Facebook’s distributed data store for the social graph. In USENIX ATC, 2013. Q. Huang, et al. Characterizing load imbalance in real-world networked caches. In HotNets, 2014. T. Harter, et al. Analysis of hdfs under hbase: A facebook messages case study. In FAST, 2014. D. Beaver, et al. Finding a needle in haystack: Facebook’s photo storage. In OSDI, 2010. Q. Huang, et al. An Analysis of Facebook Photo Caching. In SOSP. ACM, 2013. S. Muralidhar, et al. f4: Facebook’s warm blob storage system. In OSDI, 2014. L. Tang, et al. RIPQ: Advanced Photo Caching on Flash For Facebook. In FAST, Feb. 2015. L. Lamport. Time, clocks, and the ordering of events in a distributed system. Comm. ACM, 21(7), 1978. F. B. Schneider. Implementing fault-tolerant services using the state machine approach: a tutorial. ACM Computer Surveys, 22(4), Dec. 1990. K. P. Birman and R. V. Renesse. Reliable Distributed Computing with the ISIS Toolkit. IEEE Comp. Soc. Press, 1994. K. Petersen, et al. Flexible update propagation for weakly consistent replication. In SOSP, Oct. 1997. S. Almeida, et al. Chainreaction: a causal+ consistent datastore based on chain replication. In EuroSys, 2013. P. Bailis, et al. Bolton causal consistency. In SIGMOD, 2013. J. Du, et al. Orbe: Scalable causal consistency using dependency matrices and physical clocks. In SOCC, 2013. J. Du, et al. Gentlerain: Cheap and scalable causal consistency with physical clocks. In SOCC, 2014. W. Lloyd, et al. Don’t settle for eventual: Scalable causal consistency for wide-area storage with COPS. In SOSP, Oct. 2011. W. Lloyd, et al. Stronger semantics for low-latency geo-replicated storage. In NSDI, Apr. 2013. J. C. Corbett, et al. Spanner: Google’s globally distributed database. In OSDI, Oct. 2012. R. Escriva, et al. HyperKV: A distributed, searchable key-value store for cloud computing. In SIGCOMM, 2012. L. Glendenning, et al. Scalable consistency in Scatter. In SOSP, Oct. 2011. C. Li, D. Porto, A. Clement, J. Gehrke, N. Preguic¸a, and R. Rodrigues. Making geo-replicated systems fast as possible, consistent when necessary. In OSDI, Oct. 2012. M. Rosenblum, S. M. Rumble, E. Stratmann, and R. Stutsman. The case for ramcloud. ACM SIGOPS Operating Systems Review, 43(4), 2010. D. B. Terry, V. Prabhakaran, R. Kotla, M. Balakrishnan, M. K. Aguilera, and H. Abu-Libdeh. Consistency-based service level agreements for cloud storage. In SOSP, 2013. P. Bailis, et al. Scalable atomic visibility with ramp transactions. In SIGMOD, 2014. J. Baker, et al. Megastore: Providing scalable, highly available storage for interactive services. In CIDR, Jan. 2011. T. Kraska, et al. Mdcc: Multi-data center consistency. In EuroSys, 2013. S. Mu, et al. Extracting more concurrency from distributed transactions. In OSDI, 2014. Y. Sovran, et al. Transactional storage for geo-replicated systems. In SOSP, Oct. 2011. A. Thomson, et al. Calvin: fast distributed transactions for partitioned database systems. In SIGMOD, May 2012. C. Xie, et al. Salt: combining acid and base in a distributed database. In OSDI, 2014. Y. Zhang, et al. Transaction chains: achieving serializability with low latency in geo-distributed storage systems. In SOSP, pages 276–291. ACM, 2013. P. Bailis, et al. The potential dangers of causal consistency and an explicit solution. In SOCC, 2012. J. Dean, et al. The tail at scale. Comm. ACM, 56(2), 2013. Strongly consistent system의 연구자들에게 방향을 제시하기 위해 Facebook의 시스템이라는 도메인 내에서 발생하는 숙제들을 정의하고 있는 논문이라고 볼 수 있는데, 마치 Facebook에서 strongly consistent system을 일반적으로 도입해서는 안되는 이유들을 정리해놓은 듯한 느낌이 들었다. 오히려 나의 관심은 Facebook에서 데이터의 복제에 관한 시스템과 복제본 사이의 consistency 문제를 어떻게 다루고 있는가 였는데, 우리가 고심하고 있는 문제들이나 해결 방향이 상당히 닮아 있다는 인상을 받았다. 여러 서비스에 걸친 업데이트 통지를 위해 인프라로서 pub-sub을 적극적으로 활용하고 있는 점이나, 서비스별로 소셜 그래프의 별도 인덱스나 캐시 등을 잘 구축해서 활용하고 있는 점은 잘하고 있다고 생각했다. Facebook의 graph storage인 TAO, pub-sub 시스템인 Wormhole 등에 대해 관심이 생겼다.